Materials: Glazed and multicoloured porcelain, brass. Wood base. Fabric lampshade, Bakelite socket. Designer: Edoardo Tasca – attributed. Manufacturer: Edoardo Tasca, Naples, Italy. 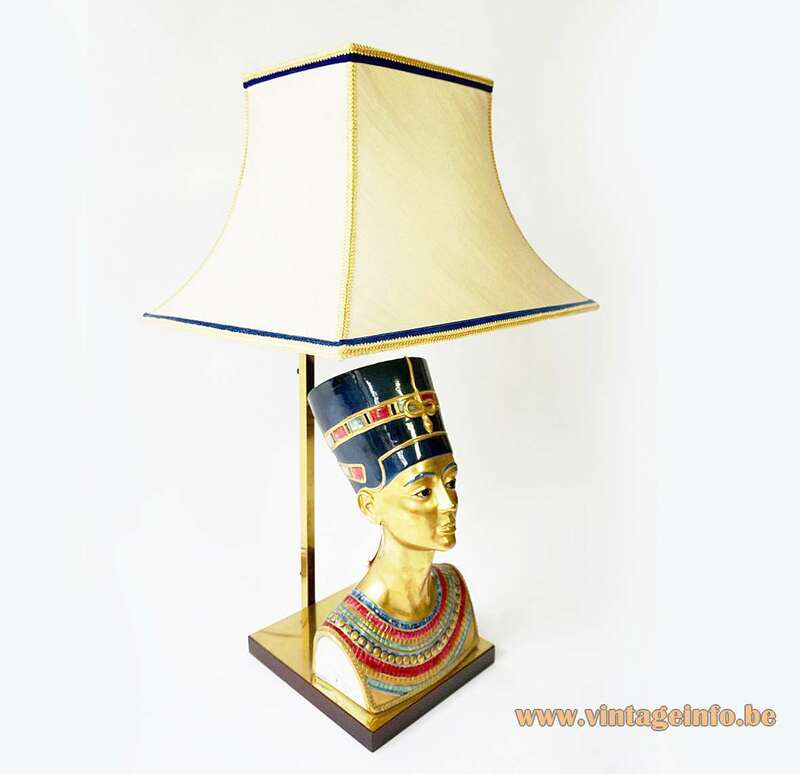 Other versions: Made with several different lampshades. Also produced as a statue without a lamp. Marked: Edoardo Tasca Scultura Viva, Ediz. Limitata, ad opere n° 1000, N. 882. N (Napoli) Italy. Edoardo Tasca Viva Sculpture, Limited Edition, 1000 works made, number 882. N (Naples) Italy. 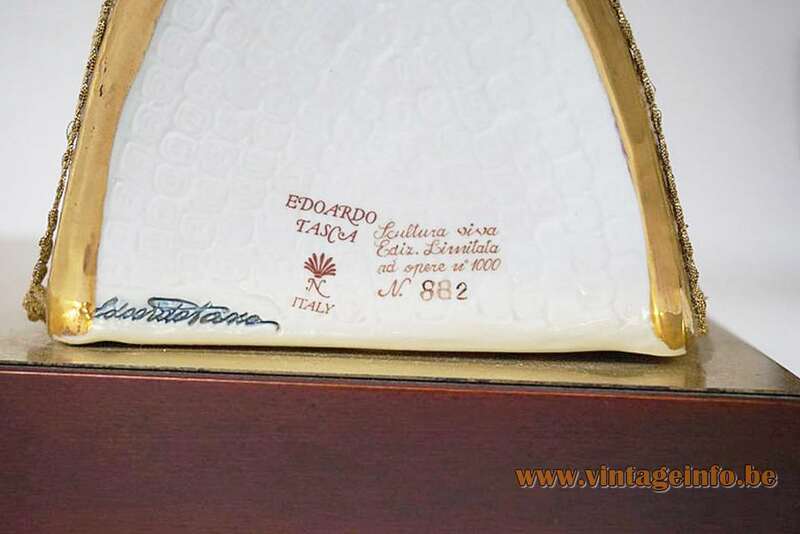 Not much information to be found of the Edoardo Tasca company. It was located in the Capodimonte region around Naples in the south of Italy were many porcelain firms are/were active. The company was specialised in figurines, with or without light. The company was at least active in the 1960s and 1970s. Many of the postures were made in a limited edition. 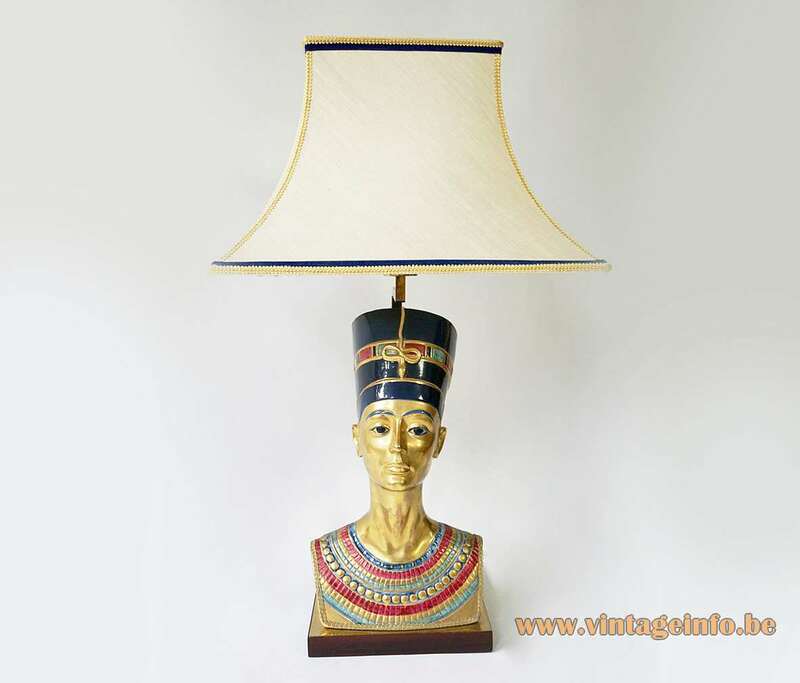 Egyptian style sculptures became again popular in Europe in the late 1960s after the King Tutankhamun exhibitions in Paris, France (1967) and Brussels, Belgium (1970). 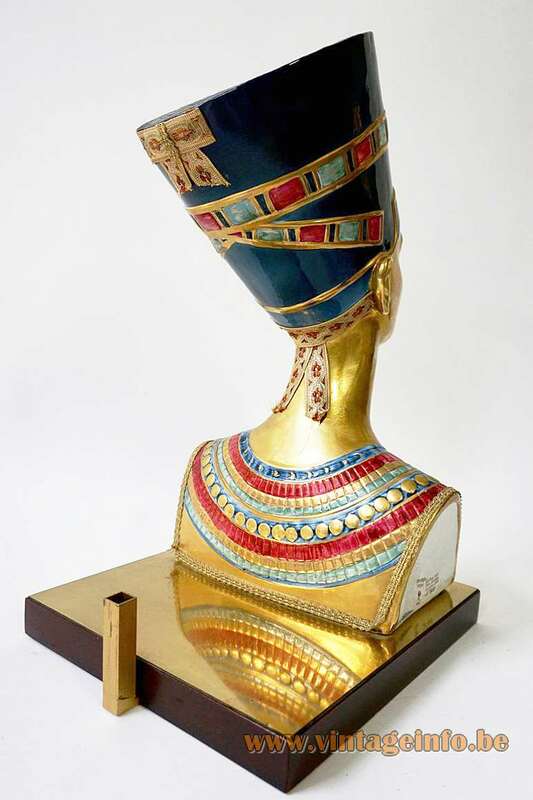 Nefertiti was an Egyptian queen and the wife of Akhenaten, an Egyptian Pharaoh. 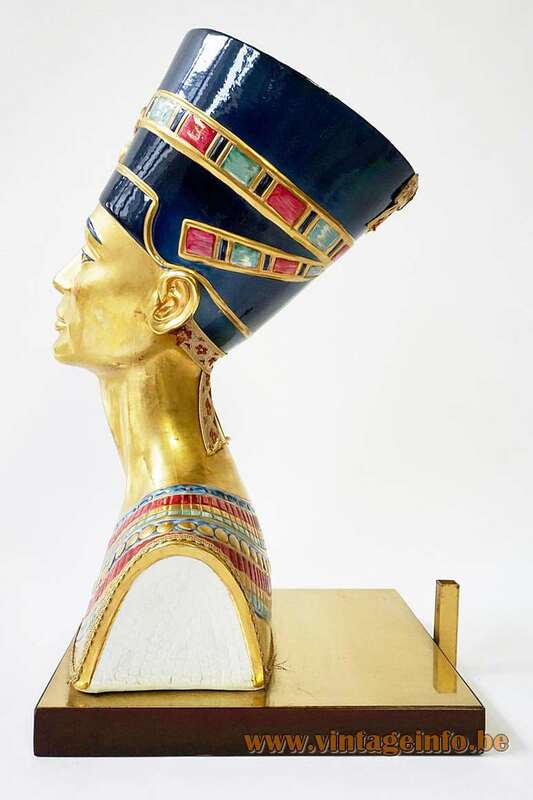 Akhenaten was the father of Tutankhamun. 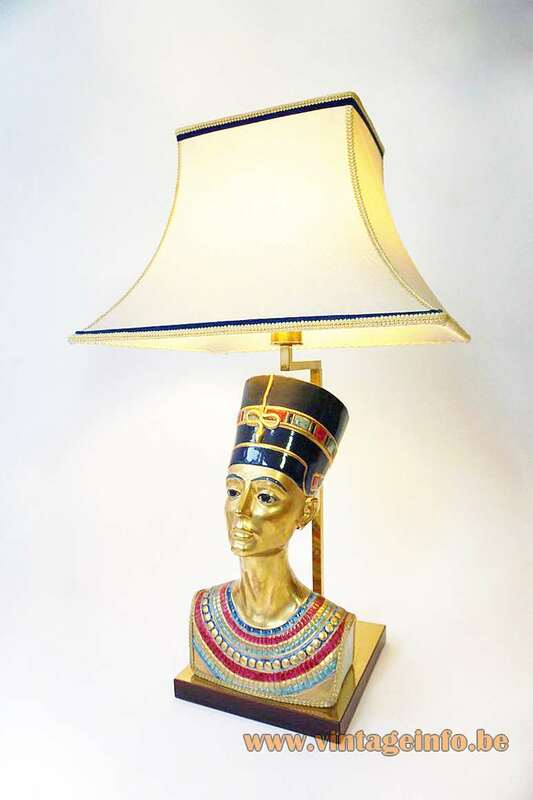 Ankhesenamun was the daughter of Nefertiti and Akhenaten and the wife of King Tut and thus likely his half-sister. The mother of Tutankhamun was one of his father’s five sisters.